With 152 dazzling colors, the Crayola Ultimate Crayon Collection has all the shades kids need to make vibrant, full-color artwork. This collection comes with a bright yellow caddy and a sharpener to keep crayons organized and ready for creating. Featuring rich colors and quality performance, this ultimate set will inspire colorful works of art and offer hours of creation. Make vibrant art with 152 bright colors. Give your young artist the supplies they need to bring their artwork to life. 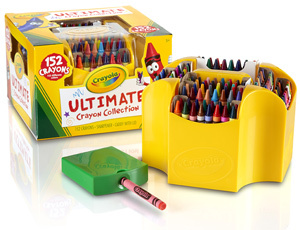 This ultimate collection of crayons offers every shade your child needs for coloring, drawing, illustrating, and crafts. The kit includes a sharpener to keep the crayons in top form and ready for use. The crayons come in a durable, bright yellow plastic caddy, offering a convenient way to display and store crayons. Ideal for desktops, the caddy includes a built-in lid to keep crayons covered when not in use. Refill the caddy with additional packages of crayons. Simply remove the inner sleeves from the 64-count box and other large-count crayon boxes. Then place them into an open compartment in your caddy. 152 Crayola Crayons, desktop caddy with lid, and sharpener.